January 25th is Robert Burns birthday. He is probably most famous for writing Auld Lange Syne which is sung around the world at the stroke of midnight on New Years Eve. 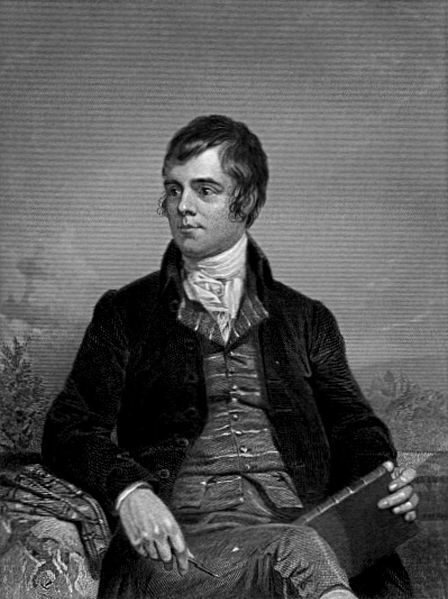 My mom is the one who introduced me to Robert Burns. When she was just a wee lass she would recite Burns poetry in school. She grew up in a pre-Internet time that rewarded silliness and so she would recite these poems as fast as she could and all of her classmates would crack up. In recent years my mom has thrown the most amazing Robert Burns party. Friends gather in their finest Scottish attire, sip fine scottish Whiskey, and the men recite Robert Burns poems. *To make this a kid friendly party I skip the whiskey. 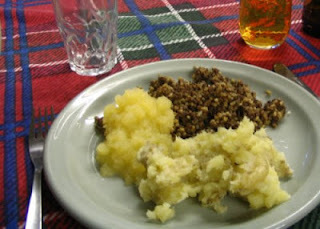 Out of curiousity, I polled a group of women wine writers about what kind of wine they would serve with Haggis. Thea Dwelle of Lucious Lushes, who had actually tried Haggis, said "A LOT of wine". Catie McIntyre Walker of The Wild Walla Walla Wine Woman suggested matching it with a nice Syrah or a bold Cabernet. My dream vacation would be to fly over to London, rent a car and drive up to Scotland and visit the Tower Edinburgh, St. Andrews Golf Course and then head across the island to Ayr to see the Robert Burns museum. Until then I will recite poetry every January 25th (and recite it quickly).